Adapted Recipe from Bon Appetit Magazine, October 2012 IssueEven though my family and I are gluten, dairy and soy free, I still find myself looking through food magazines/cookbooks that contain recipes full of gluten and dairy, maybe because I kind of miss some of those foods. This recipe was adapted from a recipe in Bon Appetit Magazine, October 2012 issue. When I saw the picture I just knew my family would love this cake. I will admit, I do get a little giddy inside when I am able to pull off a delicious dessert or savory dish that calls for all purpose flour and butter. 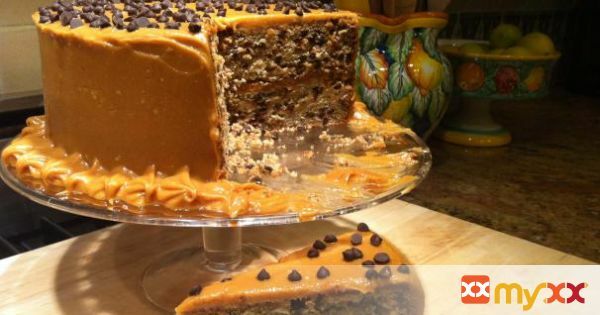 This cake is so moist, full of banana flavor filled with chocolate chips for crunch and a smooth creamy-dreamy peanut butter frosting that is just melt-in-your-mouth goodness. All without gluten and dairy! Need I say more? 3. Line the bottom of the round cake pans with parchment paper (I use pre-cut ones sold at baking stores), grease cake pans, also under parchment paper. 5. In a medium bowl, whisk flours, baking soda, and salt. 7. Using an electric mixer or a stand mixer with a paddle attachment on medium high speed, beat sugar, vegan butter, and brown sugar until light and fluffy, about 3 minutes. 8. Add eggs one at a time, beating to blend after each egg, then add vanilla. 10. Mix on low speed, just to blend. 11. Add mashed bananas and sour cream; mix until just blended. 12. Fold in chocolate chips. 13. Divide the batter evenly among the two cake pans. Smooth tops. 14. Bake cakes for 35-45 minutes, until toothpick inserted in the center comes out clean. 15. Transfer to wire racks. 16. Let it cool in the pans for 15-30 minutes. 17. Invert cakes onto the wire racks; peel off parchment paper and let it cool completely, about an hour, before frosting. 19. Using an electric mixer, or a stand mixer with a paddle attachment, beat peanut butter, powdered sugar, vegan butter, and vanilla extract until light and fluffy, about 4 minutes. 20. Place 1 cake on a platter. 21. Spread 1 1/4 cups of frosting for the inner layer. 22. Place the other cake on top. 23. Frost the top and sides with remaining frosting. 24. Pipe along the bottom edge with a star tip. 25. Chill frosted cake for 2-3 hours to set. 26. Garnish with chocolate chips. 27. Serve chilled or room temperature. 28. Chilled will result in a firm peanut butter frosting. 29. Note: For mess free decorating, put two halved sheets of parchment paper (cut apart) next to each other on the cake platter before putting the cake on it. 30. Slowly pull out from opposite ends of the cake when done piping.